With the Playskool Heros Captain America Victory Launcher, they can pretend to race in to save the day with a projectile-launching battle tank! Imagine helping Captain America speed into battle with the fierce Playskool Heros Captain America Victory Launcher! Sized right for little heroes, these figures get a battling boost with the Playskool Heroes power up arms. Kids can power up the Captain America figure with removable arms that snap on and off, featuring 2 projectile launchers. 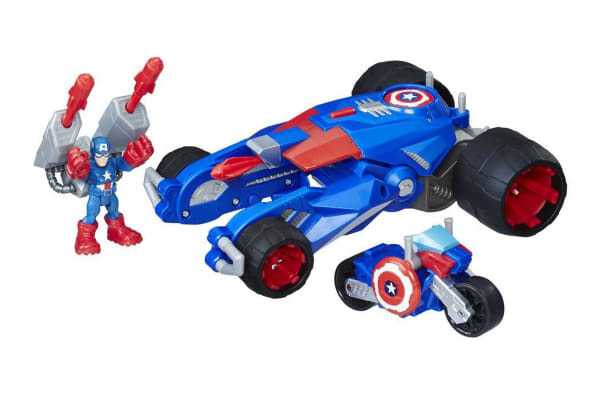 Little heroes can experience more fun by activating the Captain America’s Victory Launcher vehicle’s features. Sit the Captain America figure on the motorcycle and load them both into the tank. Kids can then pretend to rumble into battle and fire a projectile by pressing the button on top of the tank. 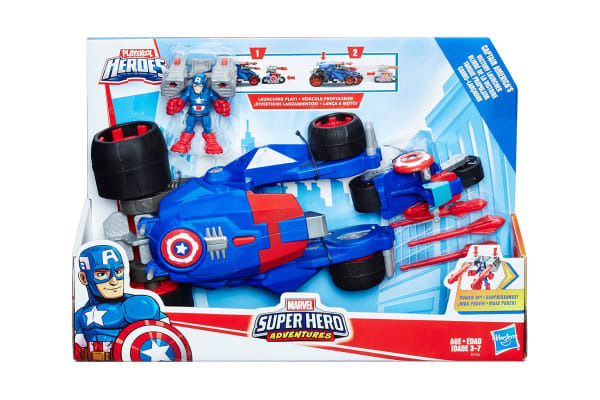 For two-wheeling heroics, press the shield on the top of the tank to launch Captain America and his motorcycle! Press the two buttons on the figure’s projectile launcher to fire 2 projectiles, 1 at a time or both at once! Kids can even place the Captain America figure on the rear of the tank to arm it with a total of 3 firing projectiles!